The food guide pyramid is a tool that provides guidelines for planning healthy diets. 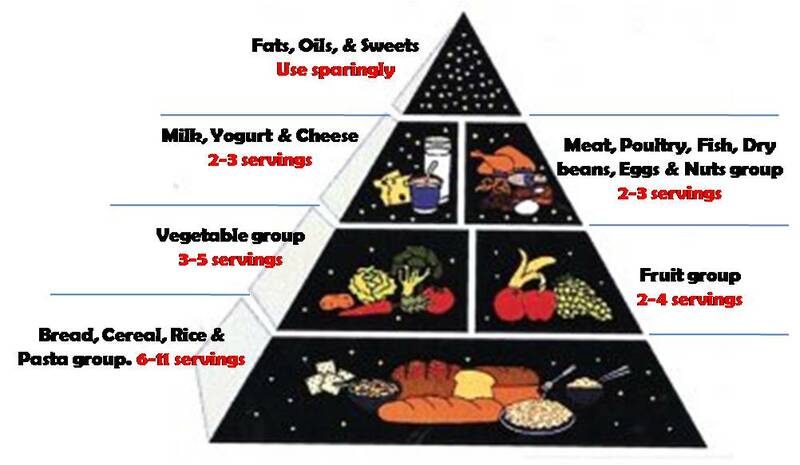 The pyramid lists the food groups and the amount to be consumed from each group. Thus people with or without special training in nutrition can plan and estimate how to meet their nutritional needs. Today’s food pyramid is designed to represent a total diet that provides sufficient vitamins, minerals and proteins which are widely advocated for healthy diet planning. The pyramid further suggests a pattern of food choices for the entire day, rather than simply a foundation diet. The number of servings to consume from each food group depends on a person’s age and energy needs. 2-3 servings from milk, yogurt and cheese group. 2 to 3 servings from meat, poultry, fish, dry beans, eggs and nuts group. 3-5 servings from the vegetable group. 2 to 4 servings from the fruits group. 6-11 servings from bread, cereals, rice, and pasta group. For children and teenagers, three servings from milk, yogurt and cheese group are recommended due to their higher calcium needs. This is also true for older adults aged 51 year and above. Alternatively, some of those servings also could be replaced with calcium-fortified foods or a calcium supplement. The foods in the final category at the tip of the pyramid, which are not a group per se, include fats, oils and sweets. These can be eaten to help meet individual energy needs but should not replace foods from other groups. The guide does not apply to infants or children under 2 years. No one food is absolutely essential to good nutrition. Each food is deficient in at least one essential nutrient. No one food group provides all essential nutrients in adequate amounts. Each food group makes an important, distinctive contribution to nutritional intake. Variety is the key to success of the guide and is first guaranteed by choosing foods from all the groups. In addition, you should consume a variety of foods within each group, except possibly in the milk, yogurt and cheese group. The foods within a group may vary widely with respect to nutrient and energy content. For example, the energy content of 3 ounces of baked potatoes is 98 kcal, whereas that of 3 ounces of potato chips is 470 kcal.